Hard alcohol infused with fruit and spices has been around forever, but it's gotten a bad rap in recent years thanks to the proliferation of objectively nasty products like, oh I don't know, bubble gum-infused vodka. If you're willing to give infused alcohol a closer look, there's this decanter from the glassblowers at Sempli. 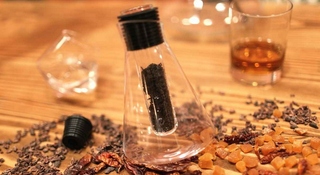 Its internal rod is perforated with holes that let the flavors of whatever you put in it seep out into the booze in the larger chamber, encased in super-strong lab-quality borosilicate glass. To avoid repeating history, the good bartenders at Lower East Side joint Death & Co have even included a recipe book for things like Red Thai Chili Rye and Ancho Chili Vermouth. You can pick one up for the fancy booze lover in your life—if it's not too late—over at Bespoke Post for $55.